Monarch at Cape May Point, Sept. 3, 2014. The weather was hot and humid for the first two days of September, with winds from the south. Monarchs don't usually migrate into a headwind. These two days were dedicated to training our two seasonal staff members, and fortunately there were a few monarchs around. September 3 is the day each year when the Monarch Monitoring Project is handed over to the new staff. It was a day off for Lindsey Brendel, but Angela Demarse conducted our three daily censuses and spent the rest of the day working around Cape May Point. And thanks to a small cold front that passed through Cape May last night, the weather was more comfortable today, winds blew gently from the north for much of the day, and there was a small influx of monarchs into Cape May Point. Angela got good tagging practice, and now looks very comfortable with a newly tagged monarch in hand (see below). Angela Demarse with a monarch she has just tagged. It's too early in the season to expect huge numbers of monarchs in Cape May, but this was an encouraging day. 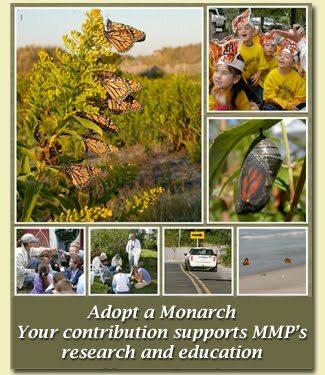 Monarch numbers were low throughout the season in 2013, and monarch numbers generally are very low, but we're hoping for a slight increase in Cape May this year. The number of monarchs was slowly increasing throughout the day, and with south winds predicted for the next few days, it's likely that many of these new arrivals will stick around. They'll find plenty of nectar along the trails and in the gardens of Cape May Point, our relatively cool and moist summer has given us an abundance of flowers. Early September is a great time of year to enjoy other butterflies in Cape May, too. Just a few that we've been seeing are illustrated at right. Top to bottom, these are common wood nymph, red admiral, and spicebush swallowtail. An experiences butterfly watcher can tally 20 or more species on a walk around Cape May Point this week. If you find yourself in Cape May Point, keep an eye out for our team members. Every day one or more of us will be working, and we're easily recognized by the butterfly nets we carry. Please stop and say hello, and we can let you know where we're been seeing the monarchs, and other butterflies, that day.